Welcome to this week's Sketch Challenge! I hope your July was great - and I hope you got your Beat the Heat challenge cards sent in! This week's sketch is a little bit "out of the box," but hope y'all will like it and make something beautiful with it. Reminders! 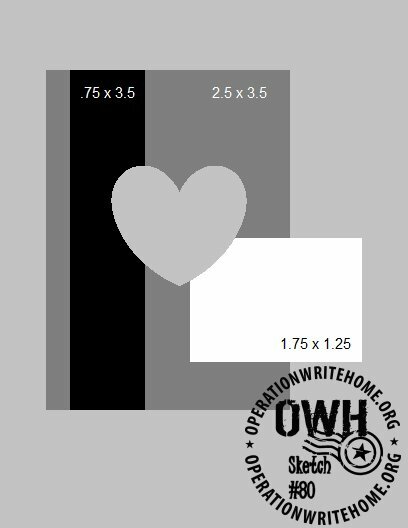 All OWH sketches are designed for A2 sized cards (4.25" x 5.5") and the heart shape indicates the embellishment of your choice, it doesn't have to be a heart. Okay, everyone, go see what you can do with this sketch! Don't forget to link your blog or gallery entry back here so we can all see! Very nice card. 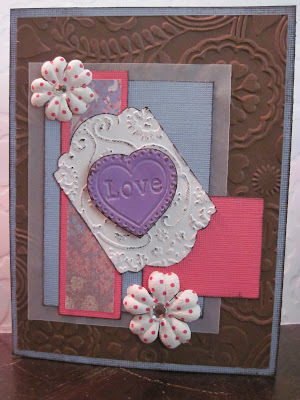 Love the embossing folder and your choice of colors. Yes, you are a creative Momma. Kudos to Allison G. for the awesome PDF file!!! Special THANKS to Allison for creating the wonderful PDF file of the Sketches! What a super idea and now I have a great reference file, right on my computer!! Very cute card Yvonne. I like the punched and embossed shaped turned on an angle. Wonderful reference for the sketches too. Thanks Allison! Thanks for the PDF. That is very helpful. Thank you Allison.. YOU ROCK!! Thanks for the pdf sketches! Thank you Allison for the sketch pdf! I often refer to these sketches when I'm having a bad mojo day! You ROCK! Great sketch and gorgeous sample, Yvonne! Love the embossed and distressed strip behind the heart. Adding my thanks to Allison for compiling the sketches for us into a PDF! It's a big help! Way to go Yvonne and Allison! I love this sketch and I am totally stoked to print out my sketches. :) thank you ladies!!! oh my! I just want to say I'm so impressed w/ the work done AND the generosity of what's provided! Such excellent help. I'm a beginner & am looking forward to producing work that is good enough to share so I can be a contributor for OWH. thank you all for what you share!!! I love, Love, LOVE all of these!!! It's so simple and do-able, yet beautiful & customizable inspiration!!! Thanks, everyone!